For the second consecutive week, Northern Illinois volleyball’s sophomore outside hitter Lauren Wicinski was named Mid-American Conference West Division Offensive Player of the Week, the league announced Monday. Wicinski’s third such honor this season ups her NIU career record total to eight selections. Last week 2010 MAC Player of the Year earned the nod after averaging 6.86 kills per set. Wicinski did even better over the weekend, tallying 7.11 kills per set during NIU’s split on its first MAC road trip. In two matches, she totaled an astounding 64 kills, hit .420, had 29 digs (3.22/set) and six aces. In a tough 3-2 loss at Ball State, she amassed 25 kills, hit .345, notched a season-high-tying 19 digs, and added three aces. In a 3-1 win at Toledo, she registered a career-high 39 kills, hitting .484, while adding 10 digs and three aces for her third straight double-double and 10th of the season. Her kill total against UT was one shy of the NIU record set in 1999, six short of the MAC record and most in the league since 2003, and eight away from the NCAA record established in 1997. She is now 14 kills away from reaching the 1,000-kill plateau in the middle of her second season in a Huskie uniform. Currently, the 2010 AVCA All-American Honorable Mention leads the conference in points (6.56/set), kills (5.65/set), and aces (0.63). Wicinski ranks sixth in hitting percentage (.326) as well. 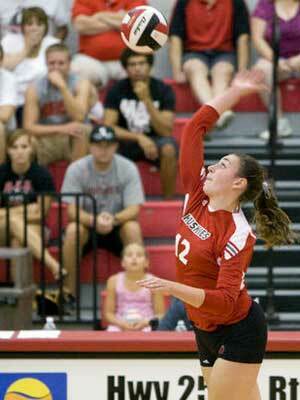 The 2010 CVU.com Freshman of the Year also leads the NCAA in points and kills, and ranks fourth in aces.